Why wont the new hair HUD work on my old hairs? So it looks like a zebra pooped on the hair you say? Well this is actually cause by a very simple problem. When the scripts were updated in the HUDs it changed the mapping of the textures. The older hairs have the mapping set up for the old HUDs. How do you fix this you ask. Well that is also very easy which I will show you set by step through screen shots. *NOTE: you will only need to update for the most recent HUD (fading autumn HUD) to use on previous hairs. Once you have detached the hair it will look like the picture above in your inventory. 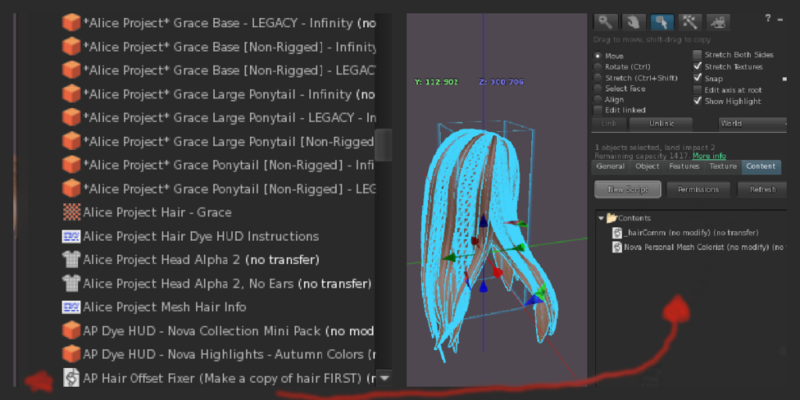 Step 2: Rez the hair onto the ground. 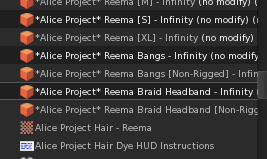 You can wear the hair and add the script to it but if it’s a hair like Reema that has a couple of parts to the hair, it’s a ton easier to rez each piece ot add the script in. Make sure you still have your inventory opened for easy access to the updater script. 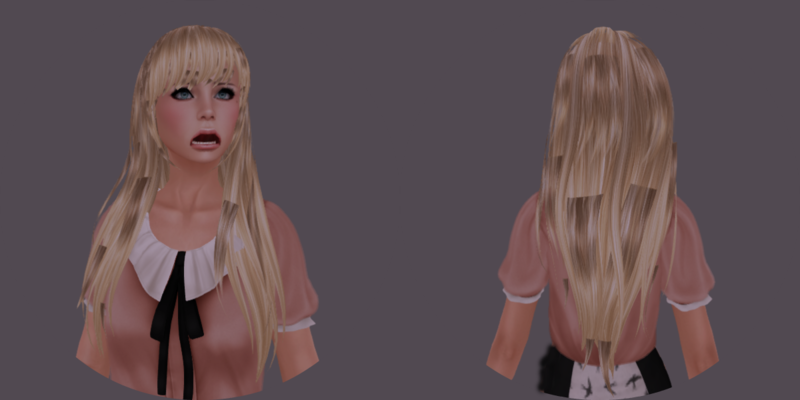 *Note: You don’t have to go into build mode you can just drop it onto the hair it will highlight the whole hair so you know it is going into the hair. 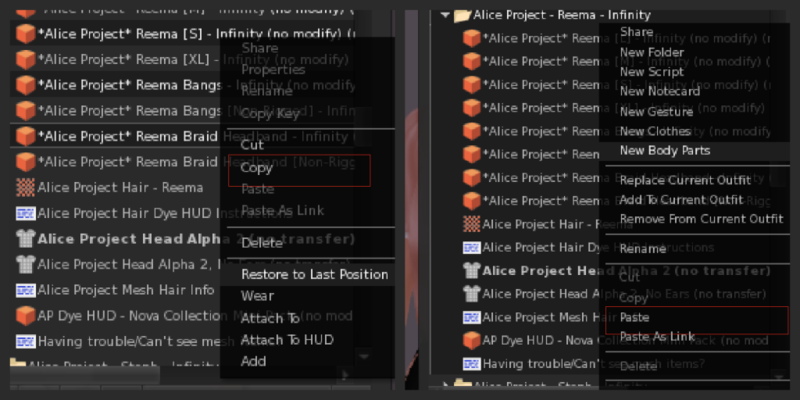 Step 4: Click on the Script the says AP Hair Offest Fixer and drag and drop it into the hair or Content tab in build mode. *NOTE: You will need to do this for each part of the hair that uses a hair texture! 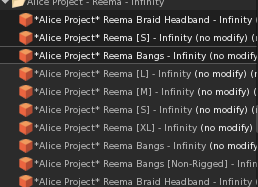 So I am showing you guys Reema you will need to do the bangs, hair and the braided headband. 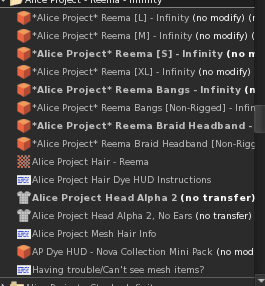 Other wise the Textures will look funky on the part of the hair you didn’t update. You will find the script inside the Grace Folder that is part of the Fall into the season hunt. It is also in the Fading Autumn HUD folder as well. Your hair will now look like this once the script has been put in.